A man who left home with an axe after telling his mother he was going to damage cars, before threatening police when they arrived to seize it, has been given a suspended sentence. Jason Heffron (41) left his mother’s home on December 23 last year after telling her he was going to damage cars with an axe on his way to the pub. His mother rang the police at 8.25pm to say she was concerned about him. 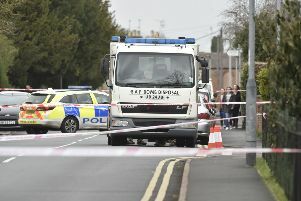 Another call from a member of the public revealed that Heffron was outside the Bulls Head in Cambridge Street, St Neots. Police attended the address and found Heffron, of no fixed abode, standing in the middle of the road outside the pub with an axe in his hand. When Heffron saw the police he raised the axe in the air and approached them while shouting abuse. Heffron then removed his t-shirt and threw the axe onto the ground before entering the pub. Officers seized the weapon and Heffron was arrested. In police interview Heffron alleged he had taken cocaine and had been drinking brandy, gin and wine. He said he was a drunken fool. Yesterday (Monday, March 25) at Cambridge Crown Court he was given a suspended sentence of 14 months for possession of a bladed article in public. In addition he will have alcohol treatment for nine months, 20 days of rehabilitation and 120 hours of unpaid work. He was also placed under an exclusion order not to enter any public house or licensed premises for three months. The axe will be destroyed. Police Constable Ryan Stevens said: “Heffron went out with the intention to cause fear and damage, acting in an intimidating manner. There was no reasonable excuse for him to be carrying an axe on his way to the pub.